Wake Up. Eat a Cookie. Eating cookies for breakfast sounds like the kind of thing that your mother would scold you for (no matter how old you are! ), but even she'd approve of these healthy morning treats. Perfect for on-the-go eating. Pssst... Don't miss the flavor variations below! Apple Cinnamon Breakfast Cookies - Swap out the raisins for 1 cup of chopped freeze-dried apples: mix 1/2 cup into the batter, and press 1/2 cup into the cookies before baking. Each Apple Cinnamon Breakfast Cookie will have 183 calories and a Freestyle™ SmartPoints® value 5*; SmartPoints® value of 5*. Chocolate Chip Breakfast Cookies - Trade the raisins for 1/4 cup mini semi-sweet chocolate chips: half inside, and half on top. Each of these will have 212 calories and a Freestyle™ SmartPoints® value 7*; SmartPoints® value of 7*. 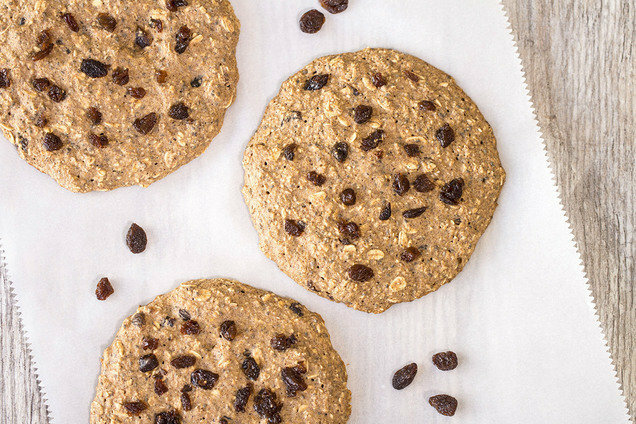 Nutty Breakfast Cookies - Replace those raisins with 1/4 cup of your favorite chopped nuts: almonds, walnuts, and pecans are all great! (You know the drill: Half the nuts gets mixed in, and half of 'em go on top.) Around 195 calories and a Freestyle™ SmartPoints® value 5*; SmartPoints® value of 5* for one of these! Cranberry Breakfast Cookies - Instead of raisins, use an equal amount of dried sweetened cranberries in the recipe. Chomp into a Cranberry Breakfast Cookie for 188 calories and a Freestyle™ SmartPoints® value 5*; SmartPoints® value of 5*. August is National Sandwich Month. What’s your favorite kind? Grilled cheese, chicken salad… BBQ pork cheesesteak? (It's a thing.) We've got healthy recipes! Your pals want cookies for breakfast too! Click "Send to a Friend" now.